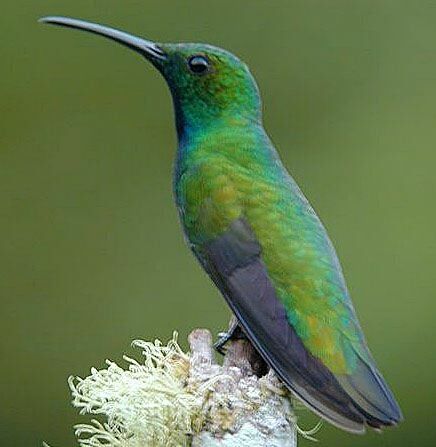 The Green-breasted Mango, Anthracothorax prevostii, is a large, dark hummingbird species with a slightly decurvedbill that occurs in Mexico & Central America. It has been reported from North Carolina. If you have a sharp photo of a Green-breasted Mango you would like to contribute for this page, please send it to PROJECTS with info about when and where the photo was taken, the photographer's name, and any anectdotal info about the bird. NOTE: Although Ruby-throated Hummingbirds are the primary focus of "Operation RubyThroat: The Hummingbird Project", we are also interested in other hummingbird species--especially vagrants that appear in winter (mid-October through mid-March) in the eastern U.S. 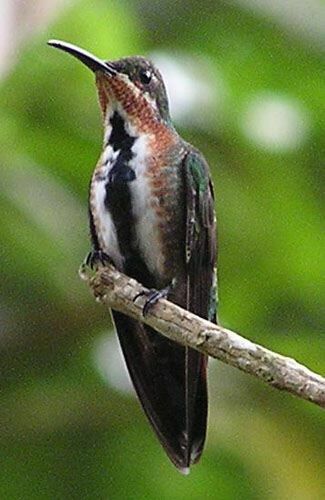 If you know of a wintering hummingbird east of the Mississippi, please report it to RESEARCH. We will contact a local hummingbird bander about capturing the bird, identifying and banding it, and releasing it unharmed.